Happy Epiphyte Day! 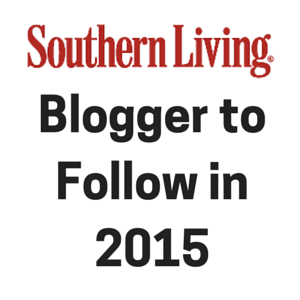 Today I'll be sharing vertical gardening ideas from myself and others in the blogosphere. 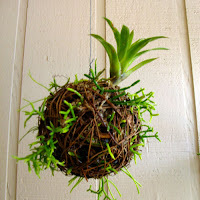 After all, what better plants are there for vertical gardening than epiphytes? 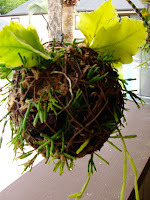 Not all of these ideas use epiphytes, but you can easily improvise and replace the soil with a more appropriate medium for bromeliads or orchids. As always, you're all invited to share your own posts on epiphytes, leaving a link in the comments field! Last week I showed you how to plant grapevine balls with Rhipsalis for a miniature hanging garden, and now I've given them a name: Rainforest Drops! I've sold my first Drop to a friend on Facebook and will be making them to order for $20 a piece. 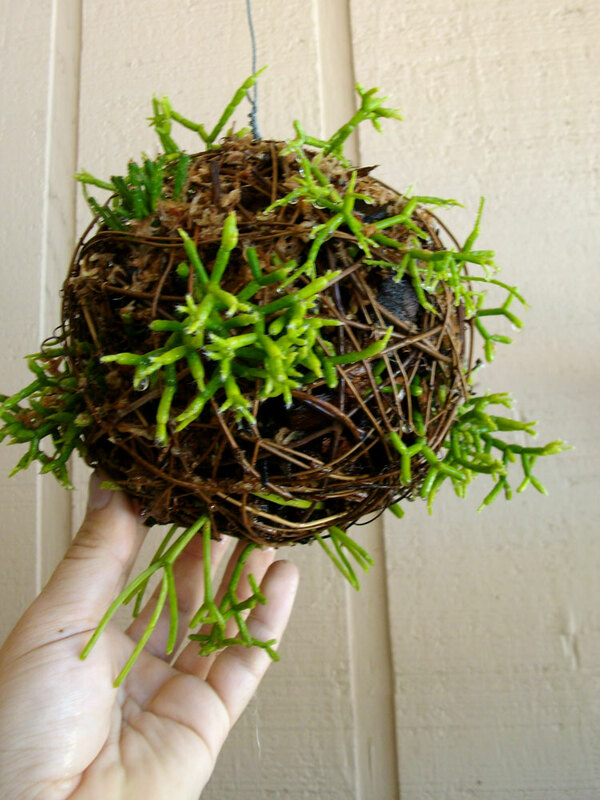 The rhipsalis will eventually drape down, forming a curtain of lush green suspended in mid-air. You can email me at steve_asbell @ yahoo.com to order, or if you'd rather make your own, here's how! After posting the pictures of my Rainforest Drop to Facebook, Renae shared a link to an amazing installation called String Gardens. 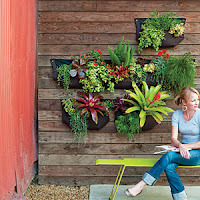 These are absolutely beautiful and all, but the terrestrial plants would need a lot of water in the home setting! I'm sure you've already guessed my solution to the problem: use epiphytes! 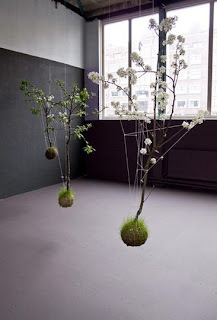 Still, it is fascinating to see how the rootbound trees and perennials find their balance when held aloft by strings. Maybe I could try growing a bonsai'd banyan tree in this way! As I was browsing through the magazine aisle the other day, I stumbled across a special publication from Sunset magazine with a gorgeous vertical garden on the cover, designed by Flora Grubb Gardens and made with Woolly Pockets. It even has bromeliads! 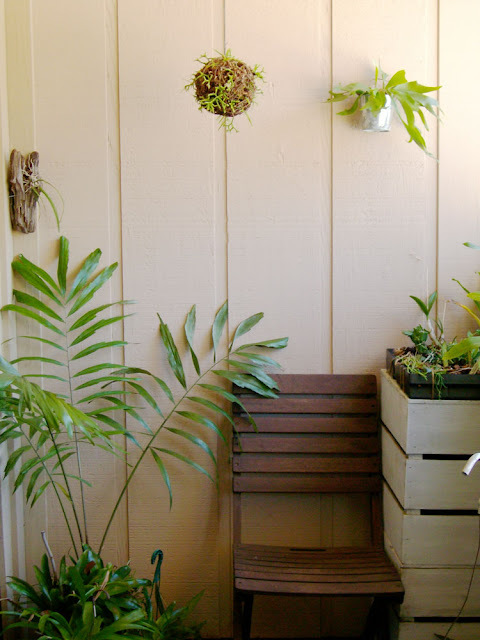 If you're more of a DIY type, Fern from Life on the Balcony shows us how to make a vertical garden using nothing more than a shipping pallet! Obviously you can replace the plants that she's used with drought tolerant epiphytes. 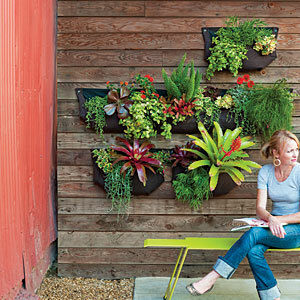 Just imagine one of these pallet gardens decked out with glistening bromeliads and dripping with ferns! Oh, and this is no April Fools joke, I assure you. 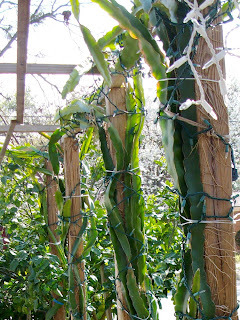 You can grow dragonfruit in North Florida. About a month or so ago I had the pleasure of visiting this remarkable woman from Cambodia and her insanely amazing garden. Along her driveway stands a large pergola that was built by her late husband, and growing up that pergola were the snaking stems of Hylocereus, otherwise known as dragonfruit! I bet you're wondering how she manages such a feat with winter temps in the low 20's. Here's how: she wraps Christmas lights all around the columns and covers the structure with all the sheets and blankets she can find. I'll be shareing more of her inventive garden later on, but I just had to share her dragonfruit trellis! Oh, one more thing. For a whole book on vertical gardening, look no further than Garden Up! 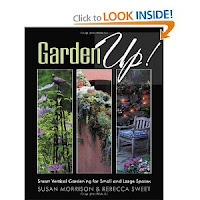 by Susan Morrison and Rebecca Sweet! 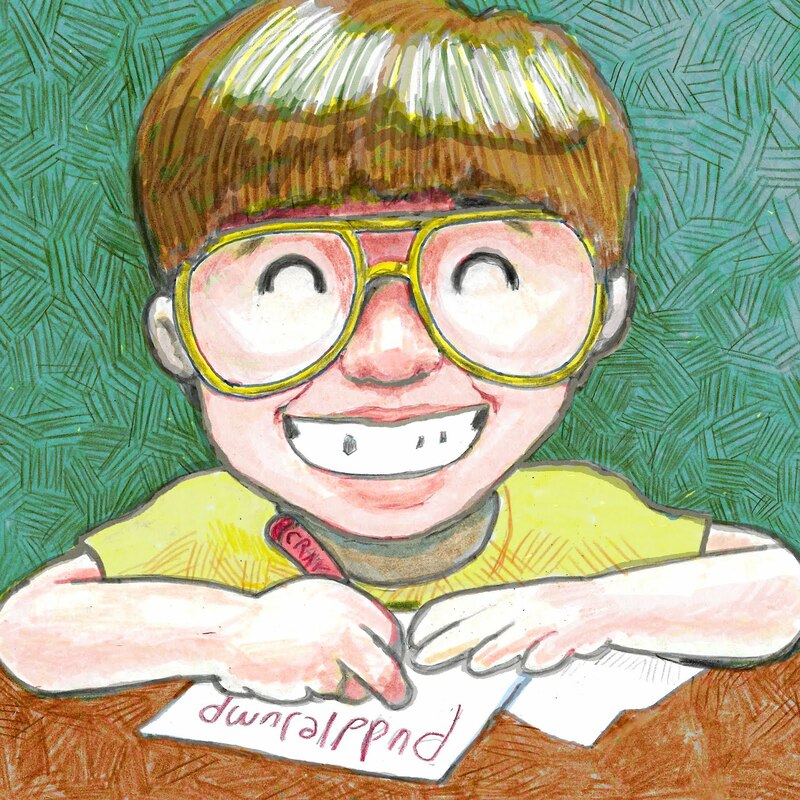 It's been on back-order at my bookstore, but you can still purchase it over at Amazon.com. UPDATE! 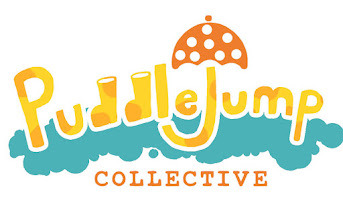 Mark and Gaz alerted me to a new blog post from one of my favorite blogs, The Tumbleweed Traveller! Have you ever admired the massive living walls of the legendary Patrick Blanc but thought they were impossible to create yourself? Wrong! The wall planted above was homemade! 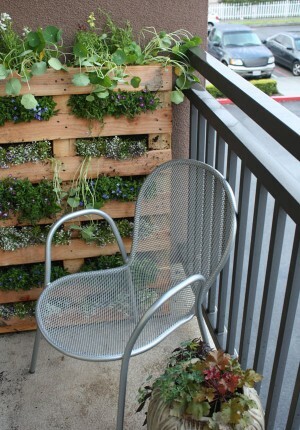 I remember seeing a post on this DIY vertical garden before, but it looks like he's finally shared how to make one. Thanks, Jamie! Last but not least, here are the entries for this month's Epiphyte Day! 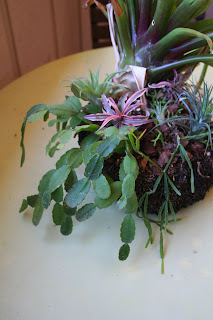 -Tropical Texana posts about an unusual "little" bromeliad hybrid that's not very little at all. -Kim of Garden in Paradise shares her wealth of Tillandsias, right from her own backyard! -Candy "Sweetstuff" shows how a strawberry planter can be used for succulents and epiphytes too! -Cats and Catts (I still love that name) posts about some of the toughest and most interesting orchids around: Oncidiums! In case you're new to The Rainforest Garden, here are some more nifty ideas that I've shared over the last year. - Does This Make My Balcony Look Bigger? Steve, you've outdone yourself...so far. What a great post! First, kudos to your Rainforest Drops and your FIRST SALE! BRAVO!!! Second, I love your various ideas for epiphyte gardening. I really like the photo of our patio...the staghorn fern in the stainless pot is awesome! Fern's garden in a shipping pallet is amazing too. Such great, creative ideas! Thanks for sharing, Kimberly! I left a comment over on your blog too, but I have to say that I always love seeing the wonders of your decidedly warmer garden and reading your funny posts... and Lola. Can't forget Lola. How clever are you? Love the rainforest drops. And pleased to be introduced to a previously unknown holiday, Epiphytes Day. I shall head to Hallmark immediately to pick up some E-day cards. You should consider selling them on Etsy, it's a good venue. Thanks for all the helpful DIY ideas, Steve. 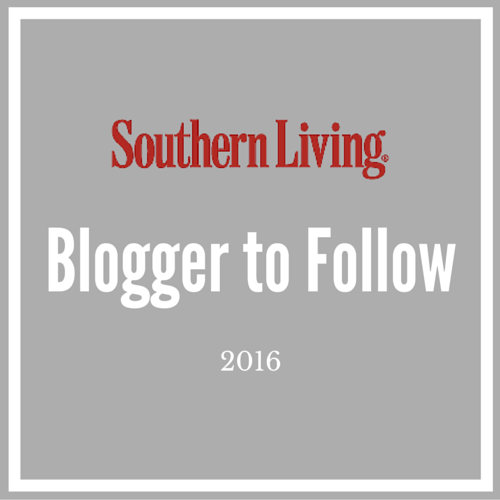 That's what I love about your blog -- here's how to buy it, here's how to do it. Now I've just got to ... do it. It really is. I'm hooked. I was waiting for him to post a how-to! It's about time, but it's still too rich for my blood at the moment. As long as you keep the bark and sphagnum moist they should be fine! I know that Debra Lee Baldwin has plenty in her book on succulent container gardens, and she's out of the desert/scrub in Cali! I just saw a succulent planted strawberry pot the other day and thought the same thing! Great minds think alike. I'll have to compile the few posts for this epiphyte day at some point tomorrow, so if anyone would still like to add a post, you're not too late! what a great concept, i love seeing the raindrop balls. thanks for sharing this wonderful/thoughtful post. I REALLY like the Rainforest drops a LOT! What a great idea and congrats on your first sale. I was at a friend's house and they had a whole bunch of the grapevine balls in a bowl. I kept staring at them and thinking...what are these things. Now I know and all I need to do is find out where to buy them, then read your step by step directions. Very cool. How often do they need water? Daily? 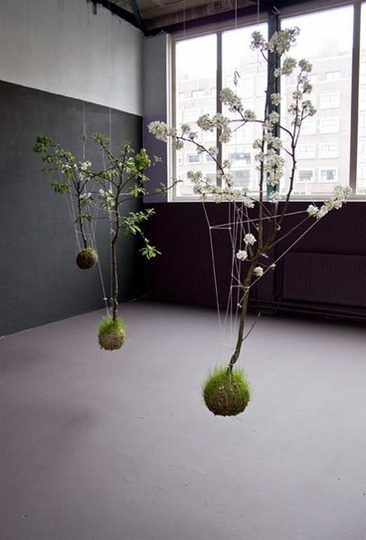 You got me with the String Garden installation... I love its elegance. 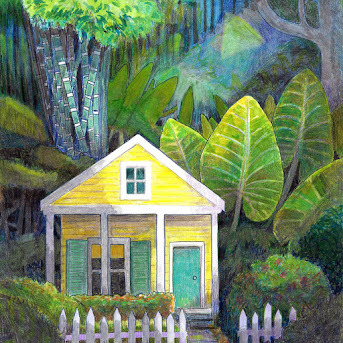 And a peek at 'Garden Up' ... now to thumb through it! I've only just discovered this post, thank you for sharing our idea. It's now in year four and looks a little drab in the winter, we chose summer colour over year round evergreens when planting. It's been frozen solid as the last three winters have been so cold ye always springs back to life. 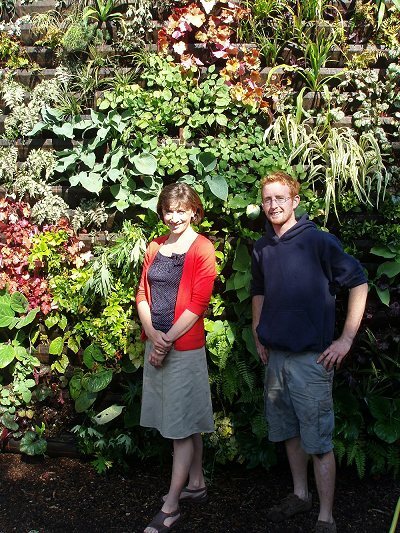 I noticed the link to the 'How to build you own living wall' blog didn't work although the post is still there. Here is the page address if you want to amend the link.